Xbox: whats the point of a xbox edition? is there a filter that covers the ground with a thin layer of water? @abrightmorre I see that ur pwning with writting scripts to mc edit is it possible for you to make script for copying mod blocks, since mcedit doesnt have 4096 ids it replaces all mod blocks with random stuff from vanilla minecraft. Any idea how to fix it? Sorry, I don't know - I don't use mods at the moment. You can try to swap in your modded minecraft.jar I think. Look at the command prompt window for the location of the jar updates. Perhaps that's all that meeds to be done. If it is flat ground you could use the brush tool. Change the height to 1 and select water source block. Or do you mean selecting an area of terrain and having a matching surface to the terrain on top of it? 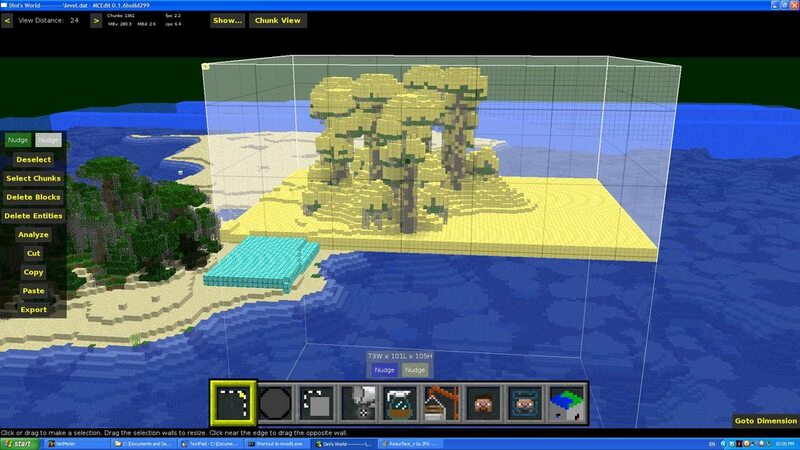 Mathcraft - turn Minecraft and MCEdit into a 3d graphing calculator with this filter. This may be irrelevant here, but I don't know where else to post. I installed sethbling's Change Mobs Filter successfully. It turns out, however, that the GUI is too large for the screen, so I cannot access the "filter" button when I am using it. This is a very popular filter, and I know I'm not the only one with these issues so can any one give me some advice? all help is appreciated! Also if anyone has a good explanation on what each part of the Change Mobs Filter does, I would love to know because some of them don't make sense to me. BTW this thread helped me a lot, so thanks! You can select the region to resurface, select water block, and run it. Be aware this script checks all the way down to the bottom of the selection box, resurfacing all the way. If you just want the top resurfaced then bump y to box.miny-1 when the air check succeeds to break out of the while loop. Could someone please write a filter to detect a required block type? I'm thinking enchantment table finder but it would be useful for finding any block. Maybe have the block(s) be highlighted within the selected area? Here is a simple script that locates all blocks of either a specific type, or a combination type and data value, within the selection area. 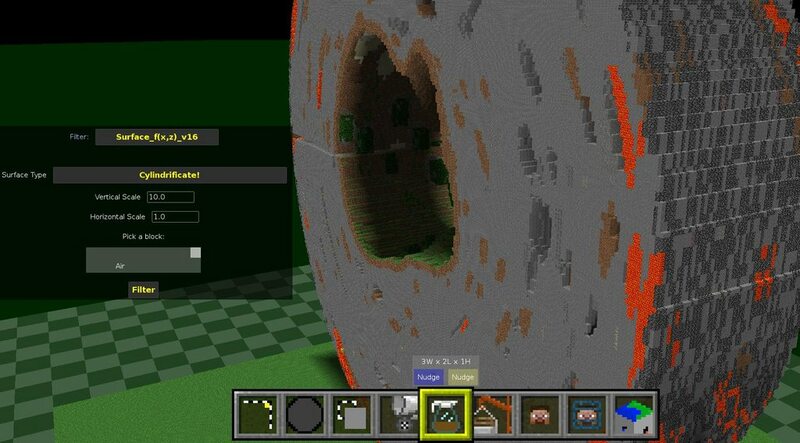 It outputs the coordinates to the MCEdit console. Try a smaller selection box? Run mcedit from the command line to see what error it is throwing when it dies. What are you doing with it anyway? I'm trying to find an enchantment table in my map. I know where it is, that's not the point, I just want to see if I'll be able to find one in other maps. I'll try a smaller box. Also, what's the difference between "Match block data" and "Match block type only"? What do they do? ETA: Not sure it did crash now, maybe it just took very long to do a big selection box? When I looked at the Windows Task Manager it said MCEdit was Not Responding. I'll give it longer if it does that again. My question about Match Block... still stands, though. Match block data would find lime wool. 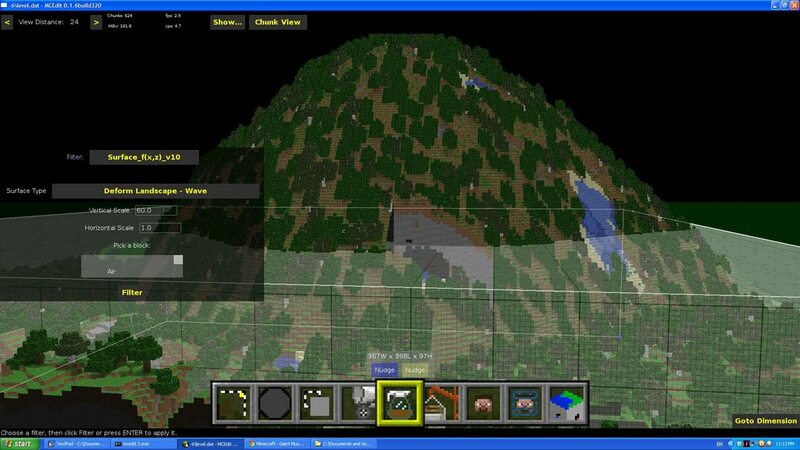 Here is an MCEdit filter that folds up a region of land into a mountain. Hi @a, need some help! Is there a filter where you can add your own crafting recipes? You simply put up to 9 items in a chest and get the 10th item. Is that possible? well, thats it. Hope someone can help me out ... and yes, I know my english skills are pretty weak. That is a great idea, however there are some challenges. There is a java class in Minecraft which defines the objects that need to be in each pattern for recipes to work. MCEdit would need to recompile that class. MCEdit script to create a cylinder map. I am having a problem with an MCEdit filter. I have installed it correctly but it's not showing up in the filters list in the actual program. The filter is SethBlings "Create Rotated Solid" filter. I have a good number of other filters in the filter list too. Is it possible that I have too much in the list? Filter to generate wind swept dunes. Sorry but is there a the download? Thanks for picking that up. I forgot to add the link. That is fixed now. The first post on this thread has some info from the author Codewarrior. I can answer your questions about the basics if you get into trouble. Some of the more advanced stuff ( turning options off and on based on selections ) I still need to play with.